Alliance once again headed out west to the world’s largest natural, organic and healthy products event – Expo West 2019! The annual expo is the best place to see new products, new ideas, and industry trends in the natural and organic food categories. This year we identified 8 trends at Expo West, based on our own observations and via the New Hope Network’s insights. Why do these 8 trends matter? Because they show the future of food. By examining consumer behavior and sentiment behind buying decisions, we can see that consumers care more about their food decisions than ever before, and will continue to be highly engaged in the future. We also provided some examples of cutting-edge brands who exemplify these trends at Expo West and are leading the way. 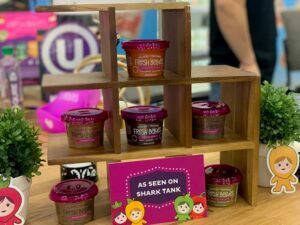 One brand that is starting the no-sugar diet early is Fresh Bellies, a baby and child food company that believes kids should learn to love vegetables without the hidden sugar. They season purees with herbs and spices, never sugar and salt. Vegetables are never masked with sweet fruit, so children learn to enjoy savory too. 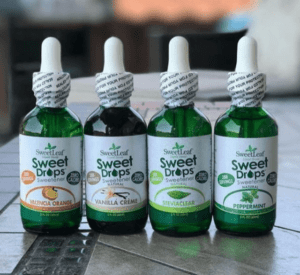 Another brand is SweetLeaf, whose new product “Sweet Drops” is liquid stevia, a no-calorie natural sweetener and sugar substitute from the leaves of a plant. Sweet Drops are a tasty, convenient way to flavor water, yogurt, oatmeal, smoothies, coffee, and more. 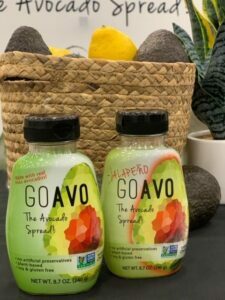 GoAvo is leading the way with their avocado spread. It has fewer calories, lower sodium, and less total fat (but more of the “good fat”), than reduced-fat mayo or even most vegan spreads! Meanwhile, KITU Coffee starts with the best coffee and then adds saturated fat and protein concentrate into the coffee. 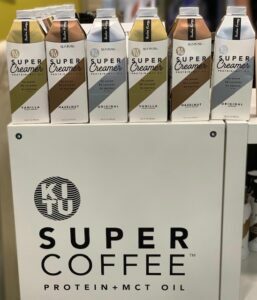 The Super Coffee utilizes healthy fats for fuel. Coconut Oil has become of the most popular “superfoods” for its powerful good fats, the elusive MCTs. “As more consumers begin to understand the benefits of eating plants, natural brands offer delicious solutions to trim meat consumption and boost the attractiveness of plants ranging from fruits and vegetables to legumes, mushrooms, nuts, and more,” Blumenfeld writes. A particularly hot trend right now is “plant meat” or vegetarian products that have the look and feel of real meat. 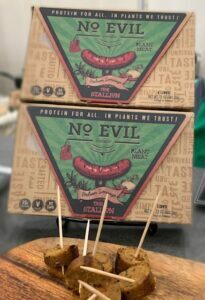 No Evil produces small batch plant meats made of 100% plant protein that has the taste and texture of meat. Products include plant ‘chicken’, ‘sausage’, ‘chorizo’, ‘pulled pork BBQ’, and ‘turkey’. 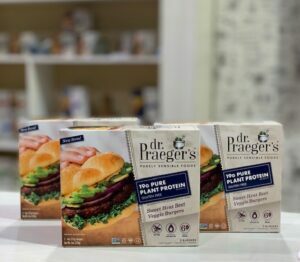 Innovation in the plant-based category continues with Dr. Praeger’s Pure Plant Protein line of frozen foods. All the entrees are made with clean ingredients providing plant-based nutrition. 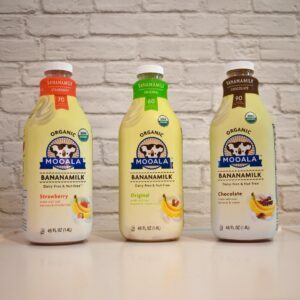 Finally, Mooala is providing organic, plant-based dairy-free milks such as almond milk, oat milk, and banana milk! 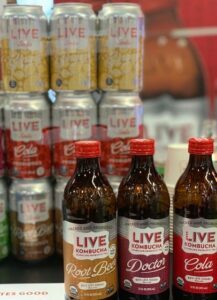 One company on a mission to bring kombucha and probiotics to a wider audience is LIVE Soda. They offer kombucha, drinking vinegars, and soda with probiotics that provide the benefits of gut-health with the taste of soda. 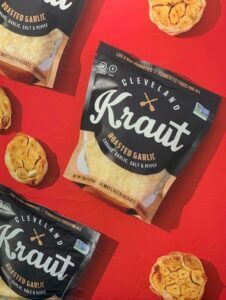 Another company working to create a healthy microbiome for people is Cleveland Kraut, which makes raw, unpasteurized and lacto-fermented Sauerkraut full of natural probiotics, nutrients and flavor. With delicious options like this, caring for your stomach health has never been easier! “Whether it’s incorporating functional benefits through food, or infusing time-saving products with the latest adaptogenic herb, innovation in convenience-focused brands is bringing nutrition back to the category,” Blumenfeld writes. 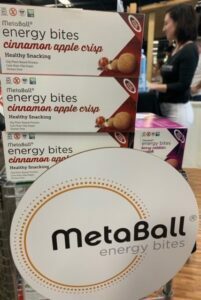 What’s more convenient than the new MetaBall Energy Bites? They provide easy, on-the-go, allergen-free energy for people with active lifestyles. Need help with a tummy ache? It’s as simple as sipping a cup of tea from Traditional Medicinals! 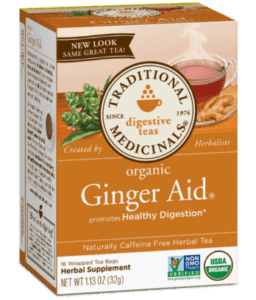 Try their organic “Ginger Aid” for healthy digestion and you’ll see that nutrition and herbal relief don’t have to be difficult. 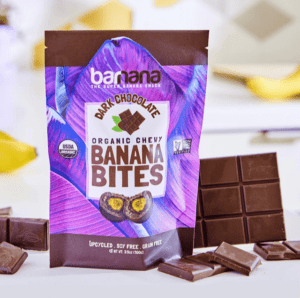 Products such as Barnana raise the bar (pun intended) on responsible sourcing by upcycling organic bananas that would otherwise be thrown away into delicious bite-sized snacks and chips! And do you dream of delicious chocolate snacks that are also organic and responsibly sourced? 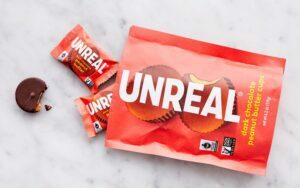 Unreal chocolate has you covered, with peanut-butter cups, M&M style candies, and more all made with ingredients that are Fair-Trade, organic and non-GMO! 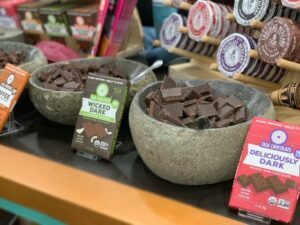 Taza Chocolate has stepped beyond “Fair Trade” and gone with “Direct Trade” to source their cacao. They created the chocolate industry’s first third-party certified Direct Trade cacao sourcing program, to ensure quality and transparency for all. “The natural industry has always cared about what goes into products. But with single-use plastic packaging receiving scorn from industry stakeholders, reusable and compostable packaging is gaining more traction,” Blumenfeld writes. One of the most creative responsible packaging ideas we have seen was from Braswell’s jams, jellies and salad dressings. Many of their products actually come in reusable, stylish glasses that complement any home decor. From high-ball glasses to carafes to pint glasses, upcycling has never been easier! “New brands are launching products in stale categories in response to consumer demand for improved trust, quality ingredients, and transparency – and the are cannibalizing sales from legacy CPGs. 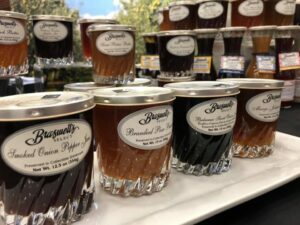 These products are often modern takes on classic pantry items,” Bluemfeld said. 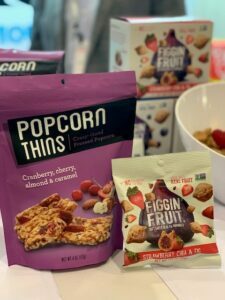 Products such as Figgin’ Fruit by Hello Delicious reinvent the “Fig Newton” into a delicious, and healthy, snack for today’s consumer. Here at Alliance Sales & Marketing, we have our finger on the pulse of trends in the food industry so your brand can grow. We are a Future-Forward, people-powered company ready to take your brand to the next level. Do you have a grocery brand that is ready to get on shelves nationwide? Are you tired of your current mega food broker ignoring your needs? Then contact Alliance today!